Alien registration records are an excellent source of family history information on U.S. immigrants who were not naturalized citizens. Aliens (non-citizen residents) living in the United States were asked during two different historical periods to register with the U.S. Government. Following the beginning of United States involvement in World War I, all resident aliens who had not been naturalized, were required, as a security measure, to register with the U.S. Marshal nearest their place of residence. A failure to register risked interment or possible deportation. This registration occurred between November 1917 and April 1918. The Alien Registration Act of 1940 (also known as the Smith Act) required the fingerprinting and registration of any alien age 14 and older living within or entering the United States. 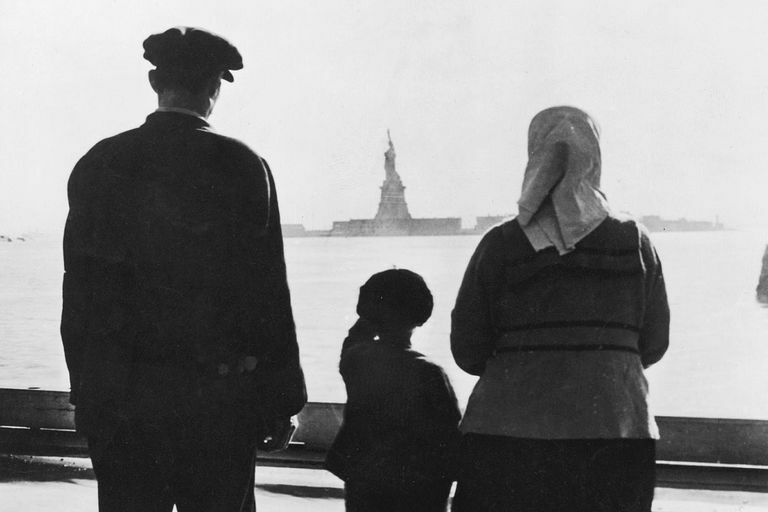 These records were completed from August 1, 1940 to March 31, 1944 and document over 5 million non-citizen residents of the United States during this period. FingerprintNot all registrants provided all information. WWI Alien Registration files are scattered, and the majority are no longer extant. Existing files can often be found in state archives and similar repositories. Existing WWI alien registration records for Kansas; Phoenix, Arizona (partial); and St. Paul, Minnesota can be searched online. Other alien registration records are available in offline repositories, such as the 1918 Minnesota Alien Registration records at the Iron Range Research Center in Chisholm, MN. Check with your local or state genealogial society to learn what WWI alien registration records might be available for your area of interest. WWII Alien Registration (AR-2) files are available on microfilm from U.S. Citizenship and Immigration Services (USCIS) and can be obtained through a Genealogy Immigration Records Request. Unless you have the actual alien registration number from an alien registration card in your family's possession, or from a passenger list or naturalization document, you will want to begin by requesting a Genealogy Index Search. If the subject of your request was born less than 100 years before the date of your request, you are generally required to provide documentary proof of death with your request. This might include a death certificate, a printed obituary, a photograph of the tombstone, or other document demonstrating that the subject of your request is deceased. Please submit copies of these documents, not originals, as they will not be returned. Alien registration records (AR-2 forms) requested from USCIS cost $20.00, including shipping and photocopies. A genealogy index search is an additional $20.00. Please check the USCIS Genealogy Program for the most current pricing information. No two Alien Registration Records are alike, nor are specific answers or documents guaranteed to be in each case file. Not all aliens answered every question. Turn-around time to receive these records averages about three to five months, so prepare to be patient.